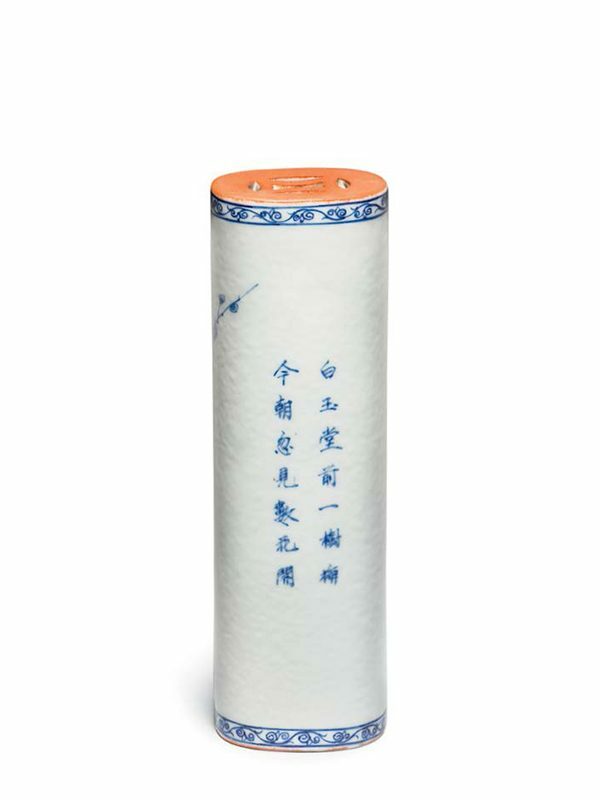 A blue-and-white porcelain paperweight of oval cylindrical form. 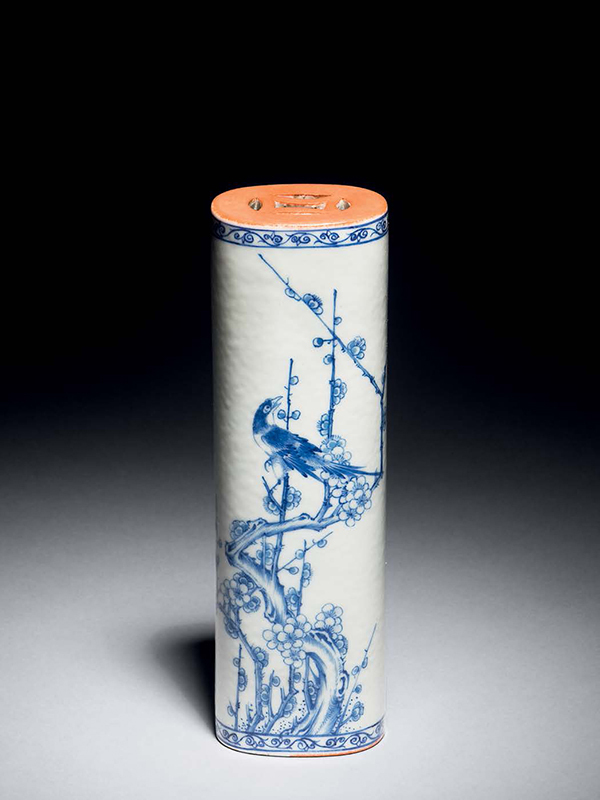 The front is painted in underglaze blue with a bird, probably a magpie, perching on top of a plum tree trunk with gnarled branches. The reverse is inscribed with fourteen characters in two lines, reading from the top right to the lower left “bai yu tang qian yi shu mei, jin chao hu jian shu hua kai” (there is a plum tree in front of the White Jade Hall, suddenly there are several plum blossoms that can be found on its branches this morning). The sides of the paperweight, carved in openwork with a coin pattern, are unglazed and painted in a bright orange enamel. This charming porcelain paperweight was made for use on a scholar’s table and served either to hold open a scroll painting or to hold down papers. The two-line inscription comes from the Tang poem Chun Nu Yuan (resentment of a woman in spring) by Jiang Wei-Han, who was an officer during the Kaiyuan era (713–741) of the Tang Emperor Xuanzong. The painting on the paperweight depicts the scene of the first two lines of the poem. A magpie on top of a plum tree also means ‘may your joy reach up to the top of your eyebrows’ (xishang meishou), or a chirping magpie on a blossoming plum tree means ‘joyfully announcing the arrival of spring’ (xibao chunxian).